What he's really claiming is that white people who make less than $50k a year and didn't attend college are bigoted. 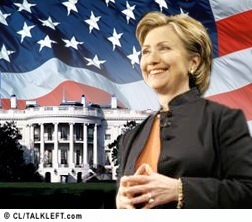 Mrs. Clinton beat Mr. Obama by 12 points (47 percent to 35 percent) among those with family incomes below $50,000. By contrast, Mr. Obama beat Mrs. Clinton by five points (40 percent to 35 percent) among those earning more than $50,000. There was an education gap, too. College graduates voted for Mr. Obama 39 percent to 34 percent; Mrs. Clinton won among those who had never attended college, 43 percent to 35 percent. My guess is that Mr. Obama may have posed less of a threat to white voters in Iowa because he wasn’t yet the front-runner. Caucuses are also plainly different from primaries. I'm not buying this at all, and I think it's insulting to New Hampshire voters. Update: DHinMi at Daily Kos on the county breakdown. This is something I was particularly interested in, see here for example, and appreciate the good analysis. More analysis of yesterday's New Hampshire primary, why Hillary won and the pollsters were wrong and what's to come. In the five days between Iowa and New Hampshire, Clinton ran a campaign. Barack Obama rode a wave. Everyone - myself included - believed the wave would not crest before Tuesday's balloting. Clinton, determined as ever, set out to do something to stop it. Update: Norah O'Donnell on MSNBC (12:45 am ET): Hillary won because of women and people over 40 and because Obama didn't get the amount of youth vote he expected. Obama fell in the "empathy" category and Hillary doubled her numbers there. Women preferred Hillary to Obama by double-digit numbers. Clinton also picked up 28 percent of voters younger than 30, after getting only 11 percent of young caucusgoers in Iowa. In another big switch, Clinton got 29 percent of voters prioritizing "change," up 10 percentage points from Iowa. With Bill and Chelsea beaming, but seated rather than standing by her side, looking fabulous and happy, Hillary Clinton takes the stage. 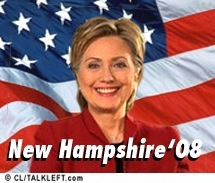 She tells New Hampshire "Thank you. I listened to you and in the process I found my own voice. " "Let's give America the kind of comeback New Hampshire has just given me." It's unanimous. CNN agrees with the AP and NBC. Hillary Clinton wins New Hampshire! The cable anchors and pundits are falling all over themselves, stuttering and trying to explain. CNN should fire Carl Bernstein. He's a buffoon and a bitter old man. Incredible rollercoaster of a ride. The Associated Press just projected Hillary Clinton the winner. He congratulates Hillary Clinton for winning New Hampshire. More about change. This sounds like the same speech he would have given had he won New Hampshire. Here's Obama. Guess he agrees Hillary takes New Hampshire. He can thank the media for its trashing of Hillary Clinton. There must have been a huge backlash -- or else the pollsters don't know what they are doing. Another pundit said he made a mistake by laying in the weeds the past two days and not putting up a fight. Update: Several media pundits have remarked his speech was a victory speech. On his new slogan, "Yes, We Can," Pat Robertson and Rachel Maddow got into a dispute whether it was meant to reach out to, as Robertson said, "illegal immigrants" (see Si, se puede) or, as Rachel said, organized labor. The importance of tonight's win can not be overstated. It was a revolt of women sick and tired of the likes of Chris Tweety Matthews and the Media Misogynists. Barack Obama did not lose New Hampshire. The Media did. Their misogynist hatred of Hillary Clinton was soundly rejected by the voters. Especially the women voters of New Hampshire. How the Media will react to this well deserved rebuke is the question. And let's be clear, Chris Matthews should be removed from covering this race. His offensive behavior is a disgrace to NBC. Thread One....Numbers, Predictions, Reactions? New Threads are below. Update: (TL 10:50 pm):Hillary won! End of live updates. Update: (TL 10:33 pm): AP is predicting Hillary the winner. Update (TL 10:24pm): 63% in, still Hillary 39% to Obama's 36%. The votes are coming in slower now. What takes college towns so long to count their votes? Wolf Blitzer says her 4,000 vote, 3% lead is a "slight" lead. He calls the race "a nailbiter." Update (TL 10:11 pm): 62% in and Hillary's still ahead, 39% to 36%. Wapole and Mason, the Beyond Currier and Ives town expected to go for Obama are already in and counted. Update (TL 10:05 pm): The pundits are all surprised. 60% in, Hillary 39% to Obama 37%. But the college towns of Hanover and Durham aren't in yet. Two more Volvo towns, going for Obama as expected, are in: Peterborough and Portsmouth. John Edwards is taking the stage with Elizabeth for his speech. He congratulates Clinton and Obama and says, "2 states down, 48 to go." Edwards: 99% of us haven't voted and we all deserve to have our votes counted. I couldn't agree more. Hang in there, John. Update: He's staying in until everyone has been heard. An energizing speech. I'm really glad he's staying in. CNN calls McCain the winner over Mitt Romney really early. It projects John Edwards will come in third. What's next for John Edwards? Will he back Obama or stay in until February 5? I hope he stays in. Update: Romney says he's staying in. Huckabee concedes. He sounds triumphant and announces they are on their way to Michigan, South Carolina and Florida. McCain's getting ready to speak. Update 12:05 am ET: The votes are in. In Dixville this year, there were three registered Republicans, two Democrats - one of whom registered Monday - and 12 who were undeclared. Hart's Location had eight Democrats, eight Republicans and 13 undeclared. 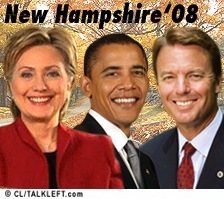 In Hart's Location, Democrat Obama received nine votes, Hillary Rodham Clinton received three and John Edwards received one. Among Republicans, McCain received six, Mike Huckabee received five, Ron Paul received four and Mitt Romney one. Hart's location had 8 Democrats, 8 Republicans and 13 Independents. If Markos of Daily Kos, a very astute observer without a dog in this fight is correct, it's a tsunami. That means those of us voting in the 47 states other than Iowa, NH and SC won't have an impact in determining who our nominee will be. What a silly system. I haven't even decided whether I'm going to vote for Hillary Clinton or John Edwards on February 5 -- 9 months before the election -- and it's already too late for my vote to matter. What's even sillier is that the decision as to who gets the Democratic nomination is being made more by Independents than by registered Democrats, since these early states allow Independents to vote in the Democratic primary and they are turning out in droves. In Lebanon, N.H., Obama criticized rival Hillary Rodham Clinton for chastising him in a weekend debate for raising "false hopes" about what he can deliver for the country. Obama said President Kennedy didn't look at the moon and decide getting there would be a false hope, and Martin Luther King didn't decide segregation couldn't end. "If anything crystalized what this campaign is about, it was that right there," Obama said of Clinton's comment in the debate. "Some are thinking in terms of our constraints, and some are thinking about our limitless possibilities." Hillary responded today -- making the point that it was a Democratic president, Lyndon Johnson, who made Dr, King's dream, the Civil Rights Act, a reality. here's the video, it's at 3:45 minutes in. Obama also invoked Dr. King in Manchester today. Who does the media accuse of playing the card? Hillary. Go figure. Hillary Rodham Clinton's campaign stop was interrupted on Monday when two men stood in the crowd and began screaming, "Iron my shirt!" during one the New York senator's final appearances before New Hampshire voters cast primary ballots Tuesday. Clinton, a former first lady running to become the nation's first female president, laughed at the seemingly sexist protest that suggested a woman's place is doing the laundry and not running the country. "Ah, the remnants of sexism -- alive and well," Clinton said to applause in a school auditorium. ..."As I think has been abundantly demonstrated, I am also running to break through the highest and hardest glass ceiling," she said. Clinton later joked about the incident as she invited questions.